I bought this griddle for my husband since he is a pancake monster. He made an entire batch of buttermilk pancakes in minutes. They turned out really great. What a difference from putting two frying pans on the stove and trying to cook two pancakes at a time in each. 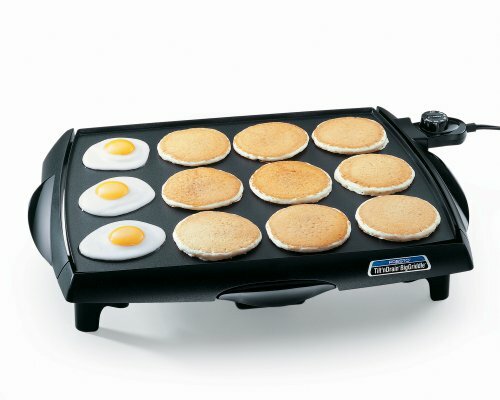 I was searching for the biggest griddle I could find and this is. It like that it is more square, unlike most which are more rectangular. It holds alot of food and cleans easily. No complaints. No kidding, we're talking Really, REALLY BIG! As in, fry nine eggs big. Or a half pound of bacon big. Or eight grilled cheese sandwiches big. All at the same time, and the food is evenly cooked, golden brown and delicious. In fact, the first use I put the Big Griddle to was pancackes... it absolutely makes the best pancakes you'll ever eat! AND... it makes them six-to-eight at once. Get ya a nice big STACK goin', and eat 'em while they're hot... not one at a time in a pan, trying to keep the first few warm while you cook the last one. I really enjoy my new BigGriddle! It is such a time saver as you can cook a whole pound of bacon at one time and it turns out perfectly! I love the "tilt" feature that drains excess grease off the top of the griddle as you are cooking. Please be sure that you ample cupboard space to store it...this thing is BIG! Mine fits perfectly in the bottom drawer of my stove. I would rate this product a five star with one exception. While the "tilt and drain" is a great feature, the design is faulty and the cooking surface wants to "drop" to the "tilt" position all the time. This makes it difficult to fry eggs and pancakes and maintain a level surface. I have to block the front legs on each side to keep it in the upright position. December 23, 2007, Updating My Review. - It has almost been a year, and this product is still going strong! I use it on average three times a week. There has been no wearing of the non-stick surface, only a little when I accidentally used the abrasive side of a two sided sponge - My Fault. Make sure you use utensils designed for non-stick surfaces, and non abrasive cleaners and soft sponges, and you will have NO problems with the surface of this grill wearing off. This grill heats up very quickly, does not require more than a minute or two to pre-heat, get your food on there right away. An excellent product if you like to cook and never have enough room on your stove!! I bought this because I like to cook, and there is never enough room on an electric stove for all of the many pans you need to produce a good breakfast with Hash browns, eggs, French toast or pancakes, or a good burger with grilled onions, bacon and toasted buns. One nice feature is the thermostat control that is measured in degrees, and the fact that the heating of the cooking surface is very even. Clean up of the nonstick surface is very easy, but just make sure you have a sink big enough to do the cleanup in. I wash the grill in a utility sink in the garage because our kitchen sink is not big enough to the job, and even with the utility sink I have to wash 1/2 of the grill and then turn it around and wash the other half. A spray attachment in your sink would be a good idea. Nice large size, but it cooks pancakes unevenly. The "cakes" in the center (not near the heating element) are undercooked while those directly over the element can get too brown/dark. Good cooking area, uneven heat. I've used this griddle quite a bit now and found a few tricks. The griddle base is made of an aluminum plate with one imbedded oval heating coil. If you really load up the grill the heating element cycles often causing hot spots and irregular cooking. Everything cooks but really large pancakes don't get that golden brown color on the entire pancake. Use high heat for pancakes and keep the size down for better results. The grill will do one 1 lb pack of bacon which will about half fill the grease trap. I also let the kids help cook with the Cool Touch feature without concern of little arms getting burnt on the edge of this unit. Also get the Villaware batter dispenser and you've got a pancake making machine. I think the whole tilt n' drain thing is kind of gimmicky, and I haven't really found a need for it. I can't imagine cooking so much bacon (or anything) on this that I'd need runoff for the grease. Or maybe I just don't cook anything that greasy. BUT I am a huge fan of this griddle. I can see how other folks would find it heated unevenly, but I think it's all a matter of warming the surface up adequately. I usually turn the thing on before I mix the batter; after a nice long warmup, I find the surface heats as evenly as can be. My pancakes have always turned out uniformly browned. Always wanted a griddle and am very happy with this one. When making breakfast for the family and grandkids, this is the greatest tool that I have in the kitchen. LOVE IT!!! Room for bacon, eggs, pancakes, grill cheese, and even biscuits!